Indoor plants trends: what you should be looking for in your office. If you have indoor plants in your office, these are all the trends you should be looking out for. What interior plantscapers use on a job is governed by what designers specify, what has low maintenance costs and what is available from growers. The trend a decade ago was large indoor plants, whereas today’s workplaces are seeking smaller plants used in fascinating concepts. Interior plantscapers are asked to supply greenery to all sorts of situations within a modern commercial building. These include balcony plants (some in extremely harsh conditions) and a range of indoor plants, right from floor plants to hanging plants, planter boxes, plant walls and herbs for kitchens. 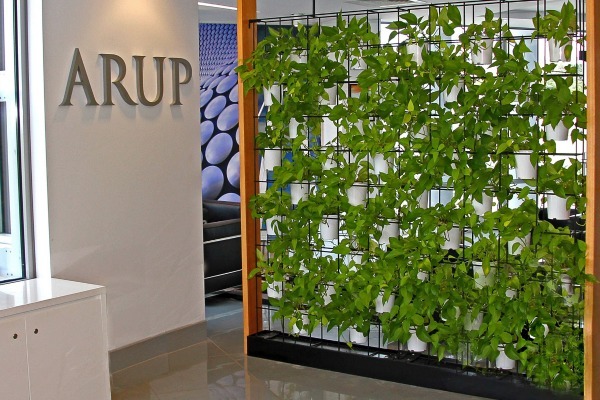 One of our clients, Arup, located on a couple of floors in the Brisbane CBD has used our company to supply them with all their horticultural needs. Arup required balcony plants to enhance the outdoor recreational areas on two balconies. One balcony was protected to some extent from the wind, and so a good choice for this balcony was large ficus. Some of the plants on the balcony at Arup. These plants need large pots and have large water requirements, which makes sub-irrigation so important. Pruning is essential to maintain these plants in pots to keep the lower foliage and to reduce the blow over hazard with wind. On the second balcony there was very little protection from the wind and being four floors up this was a challenge. We supplied the client with great Ponytails (Beaucarnea recurvate) in large shallow bowl-shaped pots, which required little potting mix. These pots provide a wide heavy base giving the plant a low centre of gravity, ensuring the plant and pot are stable in windy conditions. The indoor plants in this office consisted mainly of Tambour units with planter boxes built to fit neatly on top of office cabinets. In recent years there has been a big swing to this type of plant installation. It delivers a lot of plants at eye level throughout the office and giving a full look using small plants. The most commonly used plant species are Zanzibar gem, Sansevieria, Pothus, Aglaonema, Dracaena fragrant. As there are large volumes of plants involved with Tambour units, by using these species very few changes, have to occur, and they require little water thus keeping maintenance costs to a minimum. Growers of these types of plants in this pot size are starting to struggle with the demand, and this will continue as more of these types of installations are used. The office also contains a limited number of floor plants in the more spacious areas. 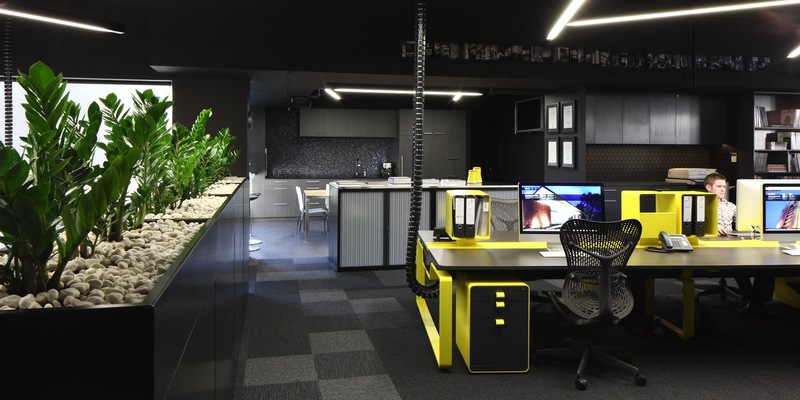 Modern offices do not have a lot of room for floor plants, with most office designs tending to focus on fitting as many people, desks and partitioning into the office spaces. The Arup office does contain a lot of hanging plants and plant walls. The hanging plants fill space where nothing else can and are also used in sections of the office to prevent staff from walking under low clearance areas. The plant walls act as an interesting and live partitioning, designed with mesh holding suspended pots. The common plant type used for hanging plants and simple plant walls is Pothus. As well as being an excellent indoor plant it can be manipulated to you individual desires. The wall of plants at Arup. In the clinical environment of an office, it is amazing how much enjoyment office staff get from watching the progress of a plant growing up a wall or down from a ceiling. Pothus is another plant that growers are struggling to keep up with the demand from interior plantscapers. The kitchen of the Arup office has a wall of herbs, which creates a beautiful aroma when you walk in. In reality, these present a real challenge to an interior plantscaper. Herbs have an enormous appetite for light and water, so a grow light indoors is essential for these. These plants certainly aren’t low maintenance and hopefully their interest indoors will be short lived. Office plants are now well known for their aesthetic and health benefits, those being – indoor air quality and psychological. 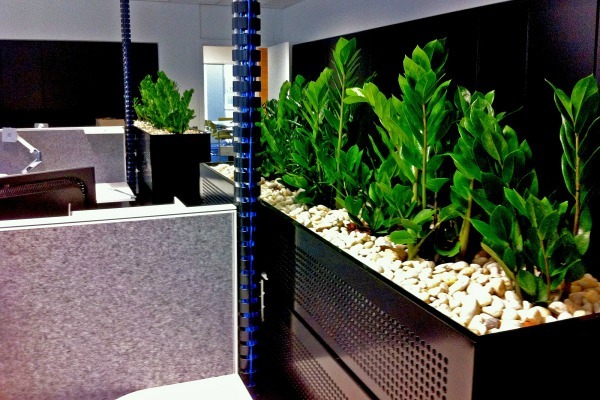 Indoor plants are now often included in the planning stage of most office fit-outs. Growers and interior plantscapers need to keep this interest in office plants with new varieties and interesting ways of using and displaying indoor plants. A version of this post was first published in the Hort Journal.